The Last Leaf Gardener: Follow Up Friday: Donna's Legacy Continues! 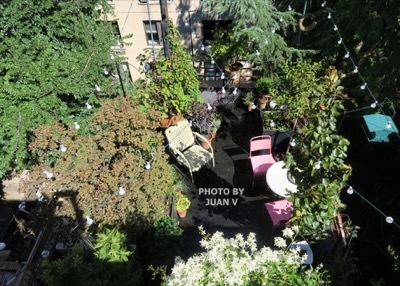 The image atop today's blog entry was taken by Juan V when he came over to help me tend to my rooftop urban (NYC) garden yesterday, on the first day of autumn. As you can see, the blooming of my Autumn Clematis paniculata (the white flowers in the foreground at the right hand side of the image) is in full swing! The vine and its flowers are playfully wrapping around Juan's Installation, which is a "structure" that is off camera in this picture, as the vantage point seen here is from above my garden. In any event, the manner in which the flowers of the Autumn Clematis wrap around Juan's installation in order to climb the wall was featured in my first garden-themed movie, The Kiwi Speaks! Fifteen Minutes of Fame...almost. I first became acquainted with this vine when Jay, a talented gardener, thought Autumn Clematis would thrive in my place. I ultimately got the clematis plants from Donna, an accomplished grower from Cheerful Cherry Farms, who, with her grower–husband, Jim, had a booth at “USQ” — the Union Square Greenmarket. The morning that I bought this plant, I had arrived at the market at about 7:30 in the morning, and the growers were just setting up their booth for the day. Because the print on the plant tag was small, I had to press my face against it to read it in order to make sure that I was getting the Clematis paniculata. Donna looked over at me and, with a cigarette still dangling from her mouth, remarked that I must need new glasses. Although it was extremely hot that morning she had on a winter coat and wool hat; her long gray pony tail hung out of her hat and trailed more than halfway down her back. She assured me if I planted this plant in a deep container it would trail wherever I trained it to go; and bloom in the fall. The clematis did not bloom that fall, but the foliage was lovely. It trailed up a small trellis that was behind its box–planter. From the trellis, the vine began to attach itself to a nail on my wall and ultimately (much later) to Juan's Installation. I came to refer the to the vine as "Donna's Legacy," because a few weeks after purchased the plants, I went down to Union Square to tell Donna about the growth of my Clematis paiculata's foliage. On that morning, I only saw her husband, Jim. It was unusual not to see her with him, and I suspected that something had happened to her, but I said nothing. I returned to USQ again, and Donna still was not there. This time I asked Jim about her. Evidently she'd been quite ill for a long time, and her husband had even suggested that she not make the trip from the nursery to vend at USQ. He laughed when I told him what she had said about my eyesight. He remarked that she was a real "diamond in the rough." The next fall season, the precious delicate flowers of the clematis began to appear as they have every fall. Against my rough brick still provide a legacy to Donna, the grower. To this day, I still think of her when I water my garden. The delicate Clematis paniculata flowers climbing about the rusty trivets that Juan so carefully installed on my tattered brick wall, a constant reminder of Donna, the diamond in the rough.